So, this post should have gone live last week, but it seems I’m unable to use the scheduling tool properly…. It’s another make for daughter No 2 to take to Madeira. The pattern is Burdastyle, #106 from May 2012. She’d put this pattern on her list of “wants” for this year. Luckily she’d had a good wardrobe clear-out, helped by her sister, last summer. So now, instead of me just making what I think she’ll like, I’m sticking to The List. While routing through my fabric stash at the same time, she chose this grey bird print cotton for the skirt. It was what was left over after making a gorgeous vintage dress I’d made a couple of years ago. There is pretty much nothing left of that fabric now, so I’m chuffed that’s another piece properly used up!! We love the high waist on this skirt, and the pockets have received the thumbs up as well! The skirt consists of front and back panels, as well as side panels, all gored to provide a decent amount of fullness that ends below the knee. The centre front consists of a concealed button stand, the instructions for which were a little odd – the next time I make this I’ll be doing it very differently. The pockets are a doddle, the welts could provide for a design feature, using an alternative grain or fabric to emphasise them would look good. Piping could also be inserted at the join. I used black buttons from the stash for the majority of the (hidden) buttons, and two grey buttons for the visible buttons at the waist. I need to get on with photographing all my June makes, I’ve been quite happily wearing them all, but no photos just yet! In the meantime, The Monthly Stitch will be kicking off Independent Pattern Month again in July and I’ve decided to take part again. I’ll do anything to get through my stash faster! Anyone else interested? 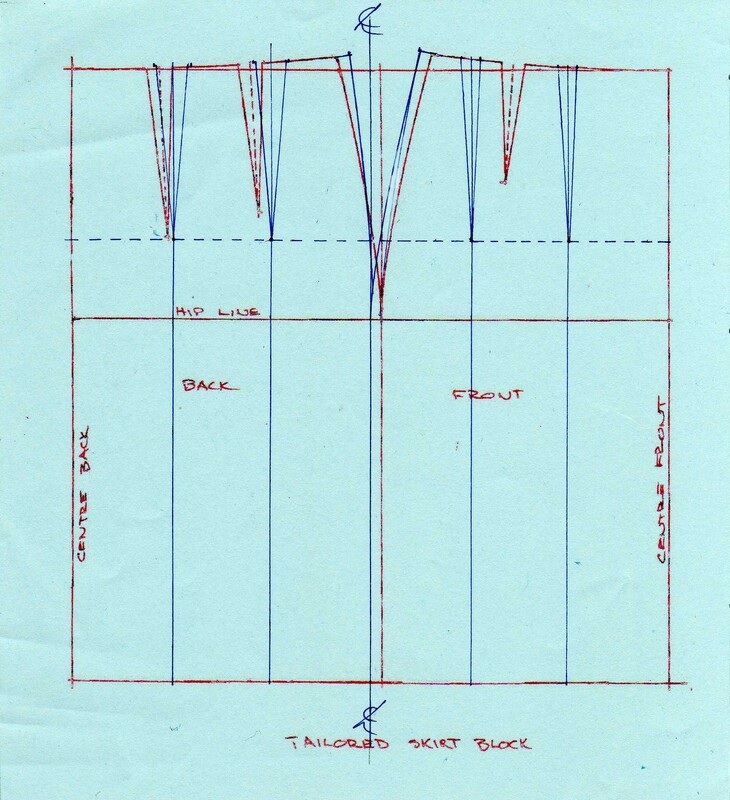 From the search engine referrals, there seem to be a lot of requests for panelled skirt patterns. I am guessing this is because of the skater skirt tutorial! Please leave me a comment if you want a tutorial on how to do these, and how many panels you are after. If there are other pattern cutting tutorials you want, please let me know, and I will do my best to get them online for you. Two posts in a week!! I think it is about time I did some catching up! 😀 Here are the instructions to make the pattern for a skater skirt, using the tailored skirt block from the previous tutorial. 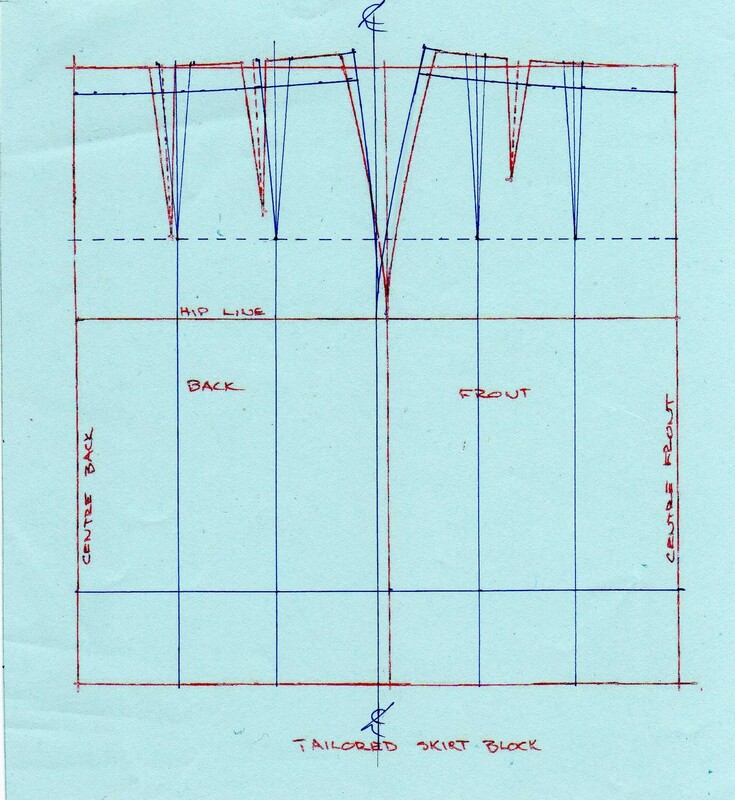 This pattern will give you a 12 panelled skirt. Trace off the skirt block as one piece. Move the side seam to the centre of the block. Divide the block along the hip line into 6 equal parts and draw lines from the top to the bottom of the block to make the panels. 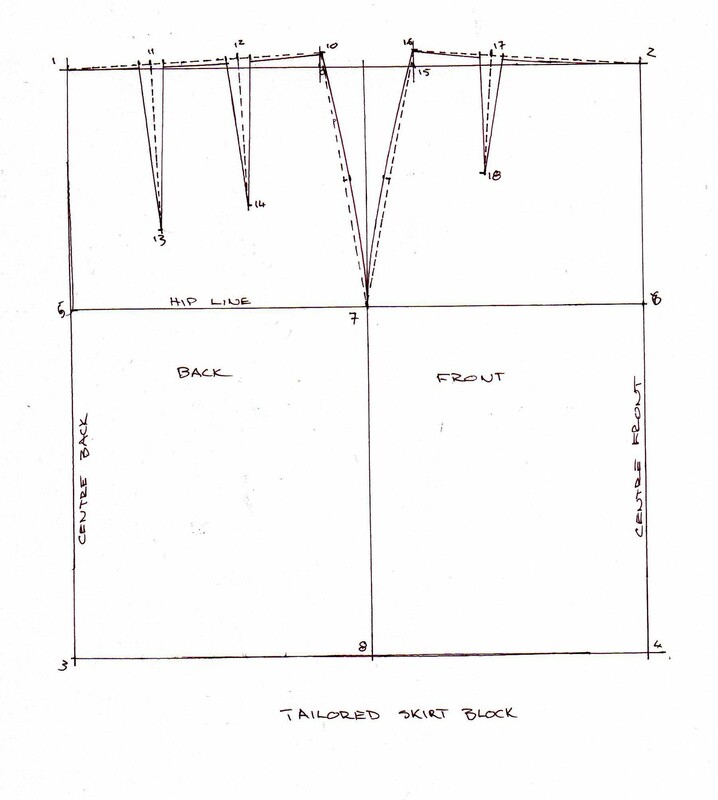 Make sure these are at right angles to the hip and hem line. The red lines in the drawing are the original block lines, the blue ones are the new lines for the pattern. Draw a dotted line parallel to the waist and hip line, 14cm down from the waistline. Construct new darts on the panel lines to touch this line. Ignore the old darts (the ones in red on this drawing). 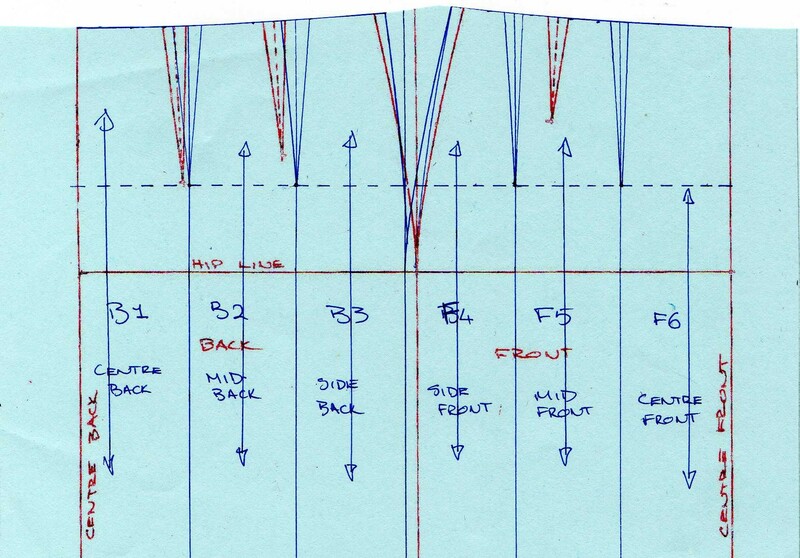 The darts on the back panel lines are 2.5cm each, and the front darts are 1.5cm each. Add 1cm to the back and front side seams and draw a new curved line to the hip point. Decide where the skirt will sit at the waist, whether you are having a straight waistband, a shaped waistband or a facing. Also decide on the finished length. For this project I dropped the waist line by 2cm and made the skirt 40cm long overall. Mark the length – don’t worry to add a hem allowance at this point, it is better to have the finished length when you toile it up. Adjust the waistline accordingly. Cut along the new waistline. Number the panels and add grainlines perpendicular to the hipline on each panel. Cut off the bottom at the new hemline. Mark a facing 5cm deep on the pattern and trace this off, including the markings for the darts. Cut the facing and close the darts to make a curved pattern shape. 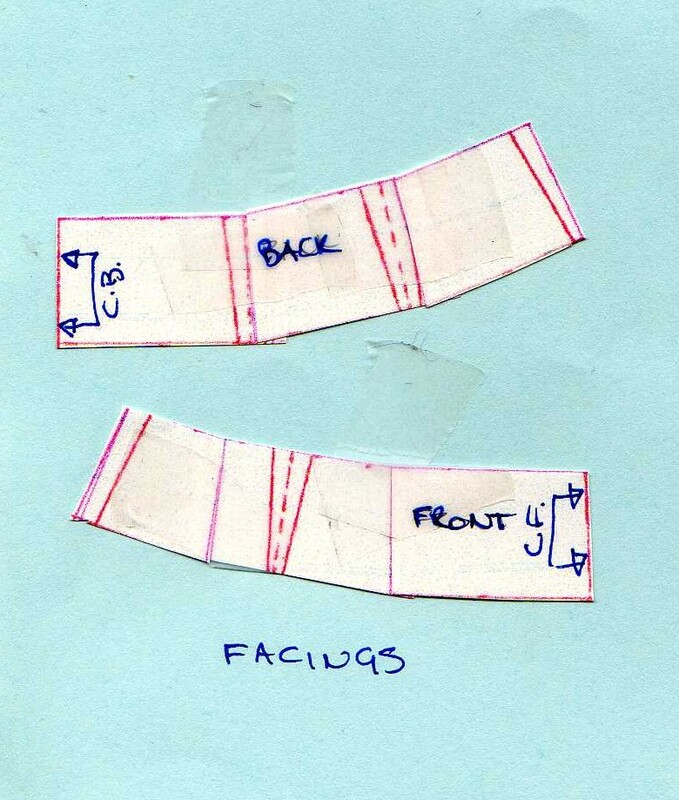 Mark the centre front and back, and for a skirt with a side zip, label the centre lines as being placed on a fold. You will need to add a seam allowance to the side seam of each facing piece, as well as to the top. Standard seam allowance is 1.5cm. Cut up the panel lines of the skirt. Stick paper down each side of the panels and add 3-5cm (or more if you want a really full skirt) to each side of each panel piece. Add seam allowance to the top and sides of each panel, but leave the hem for now. The pieces I show have had the fulness added from the dotted line that was 14 cm down from the waistline. You could also use the hipline as the start point. This would make the skirt more fitting to the hip, only flaring from there. You need to decide where you would like the fullness to start. I have shown a 4cm flare at the hemline. So that is your pattern. For making up, it is easier to make the whole front and back, and then to attach them at the side seams. Remember to leave the left side seam open to the hipline for a zip. Sew the front and back facing together at the right side seam. Attach the facing to the top edge of the skirt, clip and understitch. Interface the facing. At the toile stage you can finalise the finished length, then add the hem allowance to the paper pattern. For this skirt 2cm should be sufficient. The fuller the skirt the more difficult it will be to hem with a deep allowance. I would love to see the skirts made using this tutorial, so please post them, either on Burdastyle or Pinterest, with a link back here. Happy pattern cutting! 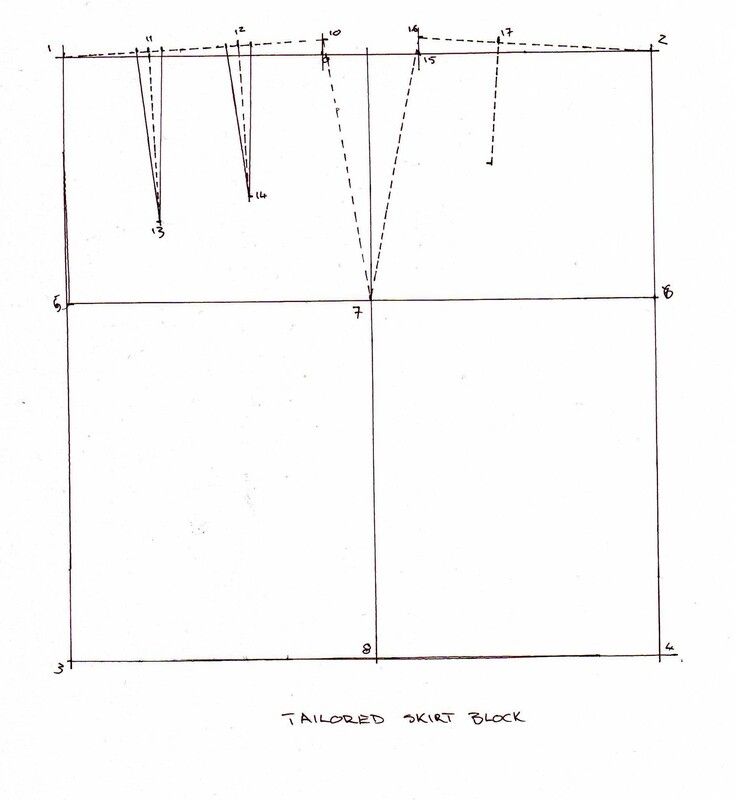 The straight skirt block is the basic skirt pattern, from which pretty much all other skirt patterns are made. 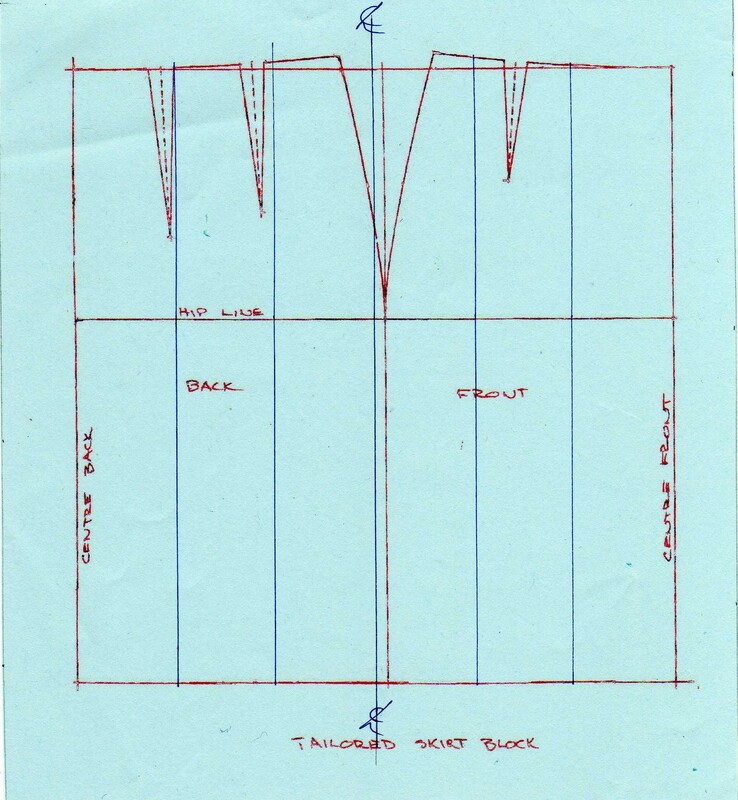 This tutorial is based on the method in Winifred Aldrich’s Metric Pattern Cutting. I have included the two size tables for your reference. You do not need to take every measurement!! 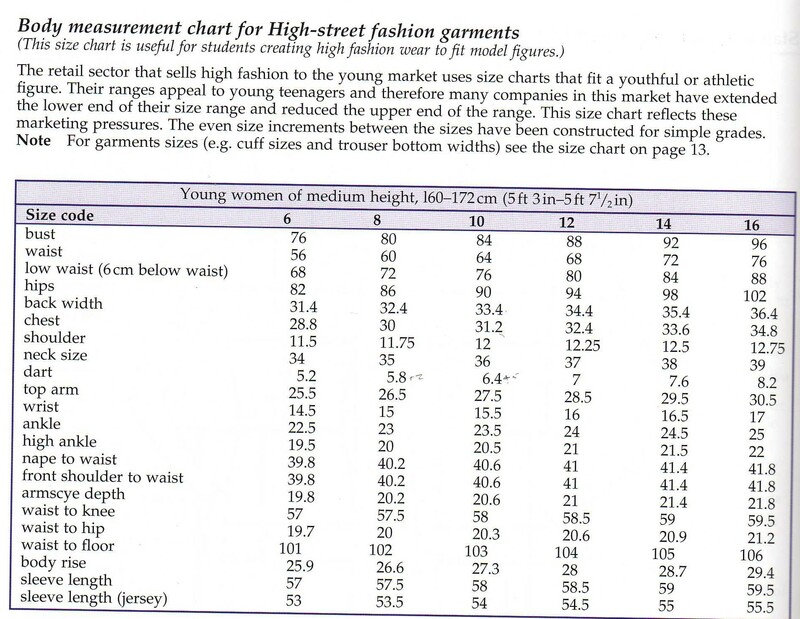 For skirts take your waist and hip measurement (if you are not sure where or how to do this, check here). Compare your measurements with the table and get your waist to hip measurement from the table. If you have different sizes don’t stress too much, the waist to hip doesn’t vary that much, so go by the one for your hip measurement. So, armed with your waist, hip and waist to hip measurement you can begin. You will be starting with a rectangle. Draw a line roughly parallell to the top edge of your paper. Put a small line and a #1 on the left of the line. 1 – 2: Measure along the line 1/2 of your hip measurement, plus 1.5cm. Make a mark and lable it #2. 1 – 3: This line MUST be 90 degrees to the line 1 – 2. Finished shirt length. 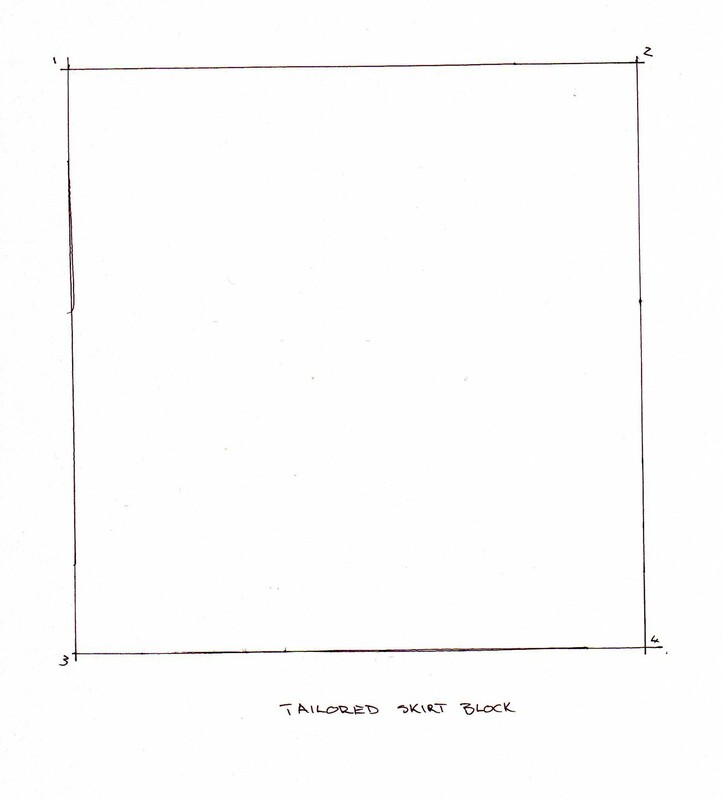 For the purposes of a block, make this knee length, so make this line about 50cm long, and mark the end with a #3. 3 – 4: Is the same as the measurement 1 – 2. Again, make sure all your lines are straight and at right angles to each other. 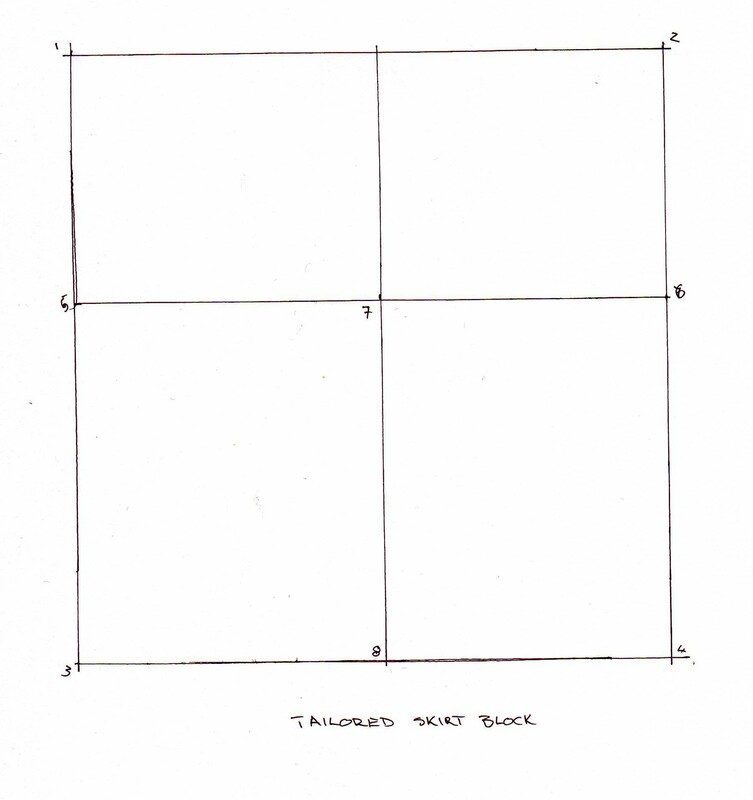 2 – 4: Close the rectangle. 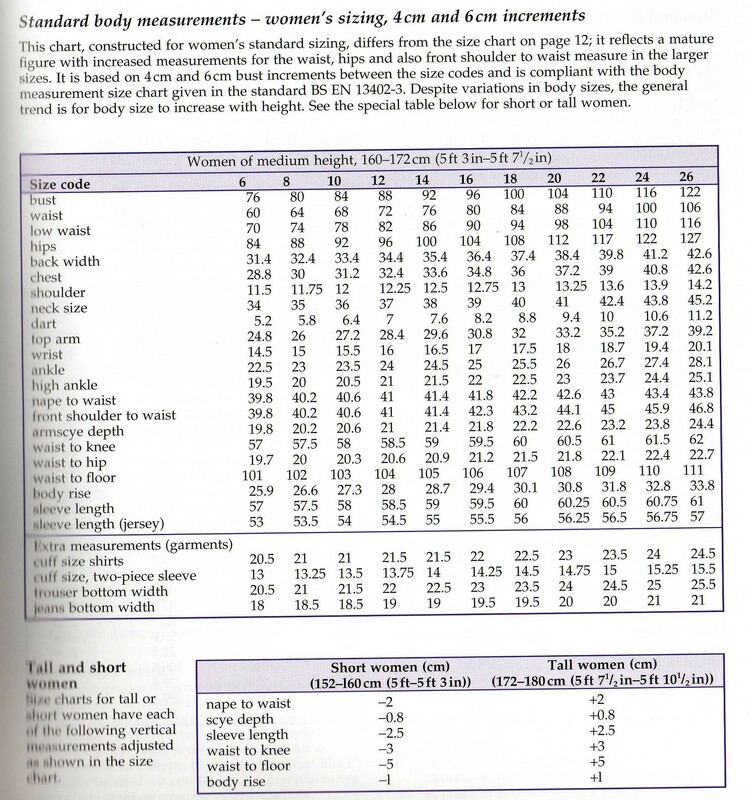 1 – 5: Waist to hip measurement from the table. 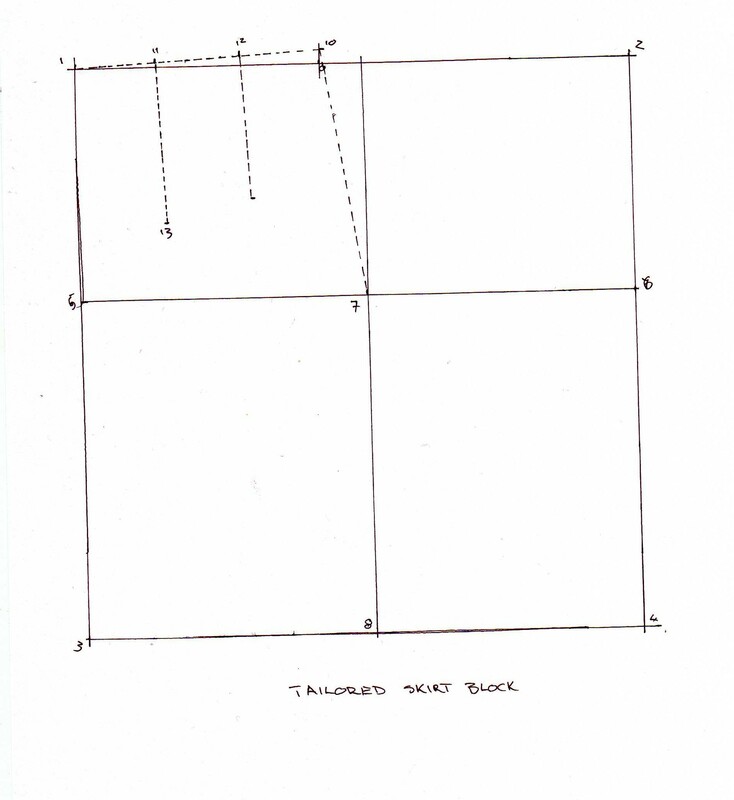 Mark #5 and draw a line across the block to intersect 2-4. Mark this point #6. 5 – 7: 1/4 of your hip measurement, plus 1.5cm. Mark #7 and draw a line down to the hem for #8. 1- 9: 1/4 of your waist measurement, plus 4.25cm. Mark #9 and draw a short line up. #10 is 1.25cm up this line. Draw a dotted line from #1 to #10. Divide this line into 3 equal parts and mark points # 11 and #12. Draw lines from these points at right angles. The line from #11 is 14cm long. Mark point # 13 at the end. The line from #12 is 12.5cm long. Mark point # 14. 2 – 15: 1/4 your waist measurement plus 2.25cm. Mark #15 and draw a line up. #16 is 1.25cm up this line. #17 is a third of the measurement 16 – 2. Draw a line from #17, 10cm long. Mark point # 18 at the end. Draw a dart 2cm wide on the line from #17. Find the halfway point of the lines from #7 to #10 & 16. Mark a point 0.5cm out from this point on each line. Draw a curved line from #10 to #7, and #16 to #7. Make sure these lines touch the point you just marked and that they flow easily to the straight line from #7 to #8. Draw a slow curve from #1 to #10 and #2 to #16. Add notations, Back, Front and centres. At this point, also add your name, the date, and the measurements you used, ie, hip and waist. This will come in handy when you want to check whether or not the block still fits you later on! So now you have a half skirt. To do the next step, you need to ink in the outer lines, the line from 7-8 and the darts. Then use tracing paper and trace out each skirt piece separately, so you have a front and a back. Cut the front out on a fold and cut 2 back pieces. Remember that the block has NO SEAM ALLOWANCE!! So add to the side seams and the centre back. Also remember to leave the centre back open from waist to hip so you can get it on! Keep this pattern uncut. If you need to make adjustments, use coloured pens to mark new lines, and DATE the adjustments. Use the patterns you traced off this one to cut up, otherise you will have to make a block everytime you want a new pattern. This is your template, keep it safe! I will post the method I used to make the skater skirt next. Happy drafting! Any questions, just shout, and if I haven’t made anything clear enough, please let me know, and it will be fixed asap!